Please welcome Anjali Bhimani to DerpyCon 2018! Morristown, NJ (October 10, 2018) – Symmetra reporting. Please welcome Anjali Bhimani to DerpyCon 2018! Anjali Bhimani is an actress/singer whose multi-decade career has spanned from Broadway to television, opera to video games, and everything in-between. She is most well known to international audiences as the voice of the light-bending architect, Symmetra, in Blizzard’s wildly popular game Overwatch. 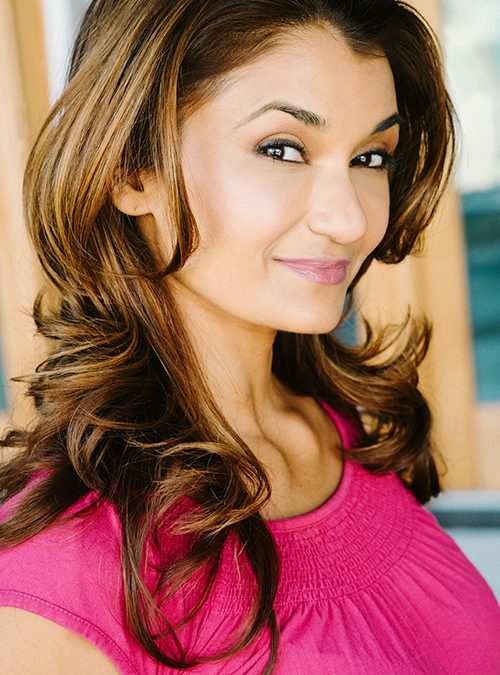 In the gaming world she has also voiced the bloodthirsty raider Nisha in Fallout 4: Nuka World and as the strong-headed sniper Stingray in in Geek and Sundry’s live-action post-apolcalyptic RPG We’re Alive: Frontier, soon to premiere Season 2 on Project Alpha. On television, audiences have seen her as Nina Patel in Modern Family and the fiesty Joya in Alex, Inc. opposite Zach Braff and Tiya Sircar, as well as in appearances on Silicon Valley, Criminal Minds, NCIS: LA, Grace and Frankie, Flight of the Conchords, Law and Order: SVU, The Sopranos, and many more. On Broadway she played the Bollywood diva Rani in Andrew Lloyd Webber’s Bombay Dreams and Myrrha and others in Mary Zimmerman’s Tony Award winning Metamorphoses. Off-Broadway and regional credits include Comedy On The Bridge/Brundibar (two one act operas translated by Tony Kushner and designed by the late Maurice Sendak), Roof of the World, The Existents (by and starring Vintage Trouble frontman Ty Taylor), Bloody Bloody Andrew Jackson, The Odyssey, As You Like It, Romeo and Juliet, Pentecost, and more. She is also the creator/host of the webseries I Am Fun Size and supports a number of causes such as Call for Code, an initiative created by the American Red Cross, The United Nations Human Rights Office, and IBM to encourage software developers to create sustainable software solutions for global and local support during natural disasters. Find her on the internet at @sweeetanj on Twitter, YouTube, and Instagram, and at Anjali Bhimani on Facebook, where you can find many pictures of her pride and joy, Charley Dog.